If you have a dog as a family pet, you probably think of them as another member of your family and that means they also need to enjoy the holidays as much as you and your kids. Our Shetland Sheepdog, Nala loves her toys and she loves to play, but in most cases it ends up with her destroying the toys, especially if it has a squeaker inside, her mission is to get it out. We love to get her those hard to destroy toys and see her try her hardest to tear them to pieces. You can see Nala pictured above with her new goDog Shag Bed, Hear Doggy! toy and Holiday Dinosaur. She is posing in the picture looking all innocent, but inside she is about to explode because she wants to get to finding the squeaker in the Hear Doggy! toy. 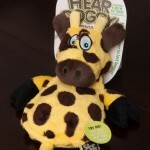 What Nala does not know is godog toys feature their Chew Guard Technology which is a manufacturing process that adds a super tough, durable liner to soft plush toys to withstand tough playing, plus all seams are double stitched. While goDog understands that no toy is indestructible they do offer a guarantee on their chew guard toy. If it does not last longer than your average soft plush toy they will replace it for free. This is one replacement for the lifetime of the product because as I said earlier they know all toys can be destroyed, but it says something to offer a guarantee to replace it one time.